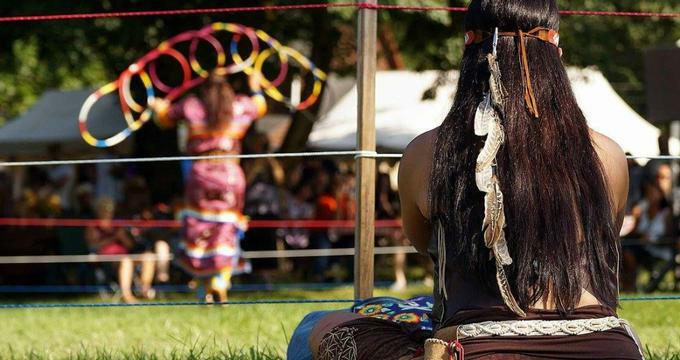 Located in Allentown, Pennsylvania, the Museum of Indian Culture preserves the social and cultural history of the Lenape and Northeastern Woodland indigenous cultures through a variety of exhibits and educational outreach public programming activities. The Museum of Indian Culture was founded in 1980 by Allentown residents Dorothy Schiavone and Carla Messinger, originally opened as the Lenni Lenape Historical Society. As the state’s oldest museum exclusively focusing on indigenous culture, the museum is housed within a historic Pennsylvania German farmhouse and springhouse facility, originally constructed around 1750 by Allentown’s Bieber family. Following controversy related to the museum’s original mission and owners, the museum changed administration in 2003 and sought to actively improve its relations with local federally-recognized indigenous tribes of the Northeastern Woodland region. By 2007, the museum was under the management of the Oklahoma Delaware indigenous tribe and had refocused its mission as an organization striving to educate Pennsylvanians on the region’s indigenous culture and tribes. Today, the Museum of Indian Culture is operated as a 501(c)(3) nonprofit organization and educational complex, dedicated to the preservation of indigenous Lenape and other Northeastern Woodland cultures through museum exhibits and public educational programming. The museum is a member-supported all-volunteer organization and serves as an indigenous research facility and outreach liaison between the Pennsylvania community and the area’s federally-recognized indigenous tribes. In addition to museum exhibits, a variety of public programming is offered by the museum, including guided tours, community outreach programming, and annual festivals and public special events. The museum’s artifact collections showcase items from Northeastern Woodland and other North and Central American indigenous cultures, including significant collections of Californian Hupa baskets, Mexican Aztec ceremonial clothing, and Pennsylvania Delaware stone tools. An artifact collection of items uncovered by amateur archaeologists Paul Delgrego, Frank Sterling, and W.W. Venney at the Broomall Rock Shelters is also showcased, highlighting traditional Lenape items dating back more than 3,000 years. Other significant collections include ceramics, carvings, photography, beadwork, and weapons crafted by indigenous tribes across North and Central America. An Intertribal Room also displays artistic creations from a variety of tribes, including a Lakota Morning Star quit, a Cheyenne sash, Navajo sand art items, Hopi textiles, and hand-carved Kachina replicas. In addition to permanent museum collection displays, a variety of rotating temporary exhibits are showcased at the museum, focusing on historic and cultural topics related to indigenous tribes and their interaction with European settlers. Past exhibits have included Warrior Spirit: Journey of the Native American Warrior, which examined indigenous participation in the United States military and service during national and international conflicts. Oral histories and photography retrospectives of indigenous service members were highlighted, along with a collection of WWII-era field radios used by Navajo Code Talkers.Treading Lightly Around Prehistoric Digs: 1980’s Interstate-78 Southern Corridor Project focused on the relationship between the Pennsylvania Department of Transportation and local archaeologists in preserving indigenous artifacts and archaeological sites prior to the development of Interstate 78’s southern corridor and the Route 309 alignment project. The endeavor resulted in the preservation of more than 6,600 prehistoric Paleoindian artifacts, including the Upper Saucon P-42 site, which is recognized today as one of the most significant pieces of evidence related to the state’s prehistory.Mystery Unearthed: The Extraordinary Story of Two Lenape Rock Shelters explored the 1942 archaeological excavation of the Broomall Rock Shelters, which resulted in the discovery of more than 200 stone and bone tools, 1,000 ceramic fragments, and evidence of European trade goods. As the largest indigenous library collection in the state of Pennsylvania, the museum’s Clair A. Carbonell Research Library showcases more than 3,000 volumes related to Northeastern Woodland indigenous history, including books, pamphlets, and photography. Significant collections are also held related to indigenous history throughout the Western hemisphere, along with special collections related to indigenous arts, languages, horticulture and medicine, historical treaties, and archaeology endeavors. The library may be used by students and researchers during museum hours by appointment. Educational field trip opportunities are offered for elementary and secondary school students, with elements tailored to Pennsylvania curriculum standards. A variety of educational programming is available for student groups, with all programs able to be tailored to meet groups’ educational needs. Programs include a Lifeways and Lore workshop for young students, a Woodland Life Skills program for middle-grades participants, and a Northeastern Woodland program for older students and adults. All programs may be presented as field trip programming or as classroom outreach presentations. Annual public special events include a Roasting Ears of Corn Festival and an American Indian Relic Show and used book sale sponsored by the Indian Artifact Collectors Association of the North East.